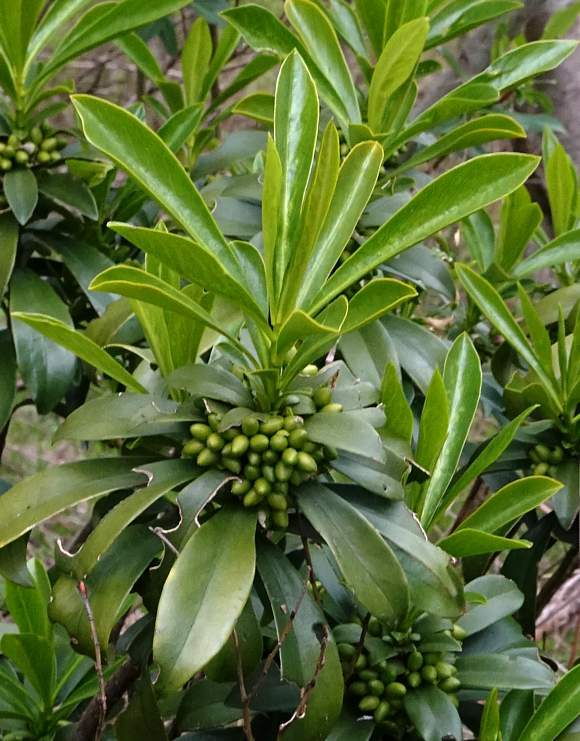 A very poisonous evergreen shrub, which has already gone to fruit having flowered much earlier in the year. Grows to 1.5m in height. The fruits are clustered beneath the new leaves and amidst and between the older leaves. The fruits are green at first turning black when ripe. 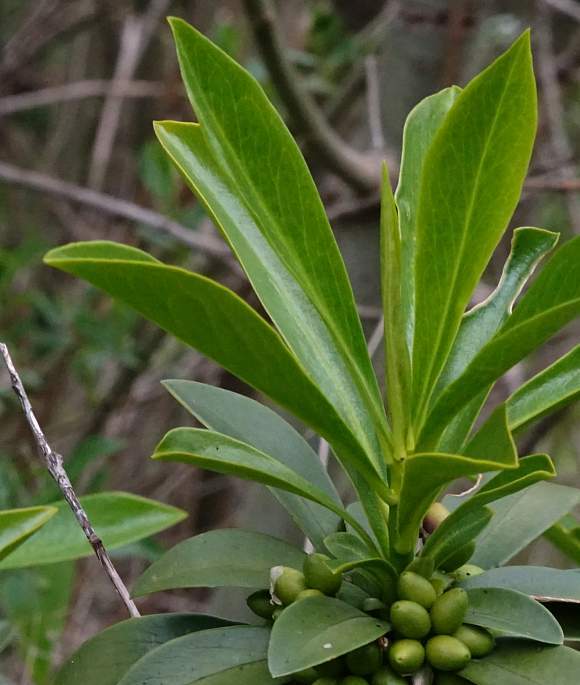 Dark-green leaves are alternate on the stem, semi-glossy, glabrous (not hairy) and similar to those of Laurel , hence the common name. Flowers very early in the year, in January / February. Flowers in clusters usually hidden beneath the leaves close to the main stems. 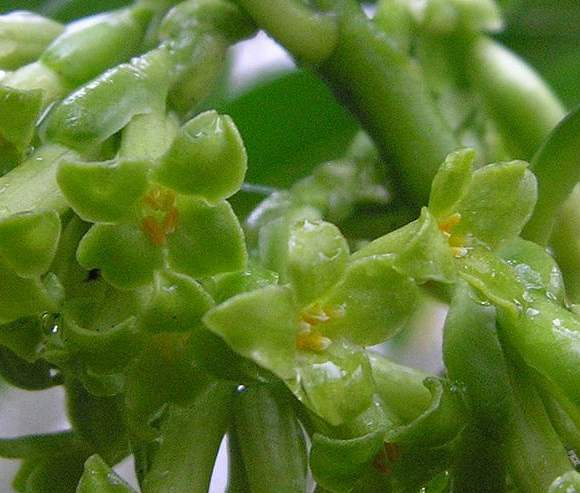 Flowers cream to pale-green and possess a slight fragrance. Tubular in shape with an abrupt 4-starred flare at the end. They look like petals, but actually they are tepals. The 4 tepals are short and triangular. Length 8-12mm. The underside of the leaves are lighter-green. Stamens within the tube stopping short of the tepals, with creamy-yellow anthers. The fawn-coloured dried-up remains of several of the tubular flowers are visible. 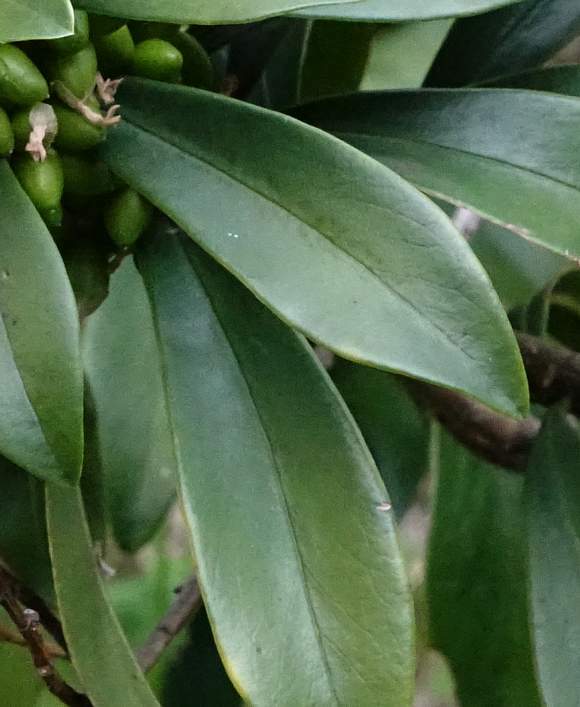 The leaves are laurel-like and lanceolate. New leaves are a bright-green and in a splay atop the fruits whilst the older leaves are dark-green. Older leaves duller and darker. Easily confused with : 'Laurels' such as Bay Laurel (Laurus nobilis) (but that has darker and pointed leaves), Cherry Laurel (Prunus laurocerasus) (but those leaves are toothed and not entire), Portuguese Laurel (Prunus lusitanica) but probably not with Spotted Laurel (Aucuba japonica) for that has distinctive leaves that are covered in golden yellow spots or splurges [a plant of similar name]. Only the first, Bay Laurel, is a true laurel. Leaves not unlike those of garden Rhododendrons but those have large red or purple flowers. 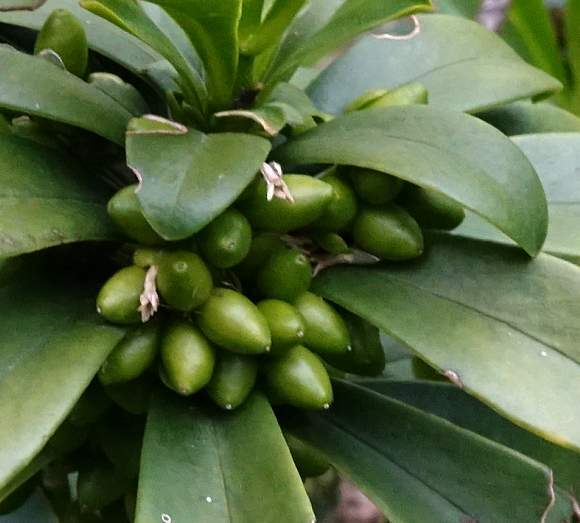 Also similar to the garden cultivar Skimmia x confusa 'Kew Green' which has similar small tubular flowers in a similar lime-green colour but the petals are cream coloured, 5 in number and are on prominent display above the leaves. 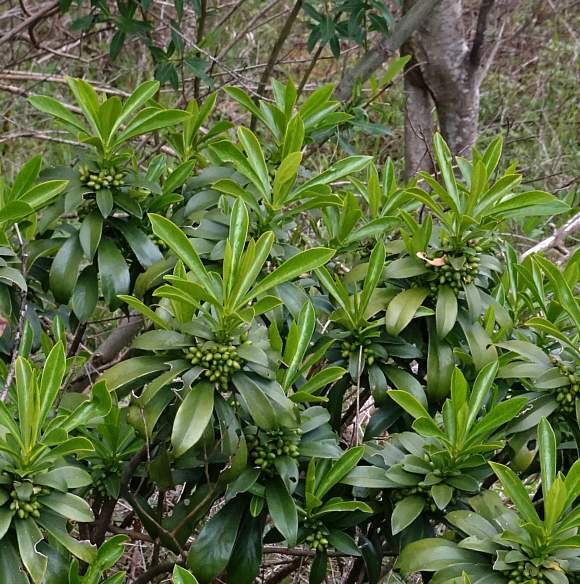 Your Author knows this because he took a great number of photos of the latter hoping it was Spurge-Laurel. No relation to : Spurges such as Sun Spurge (Euphorbia helioscopia) [a plant with similar name] save that they too have a caustic sap. It is native in some parts of the UK, an alien elsewhere. 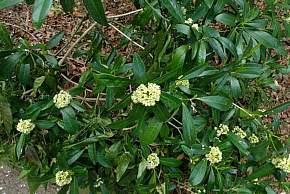 Grows in woods or scrub, especially on lime or clayey soils; mostly in the Southern part of the UK. 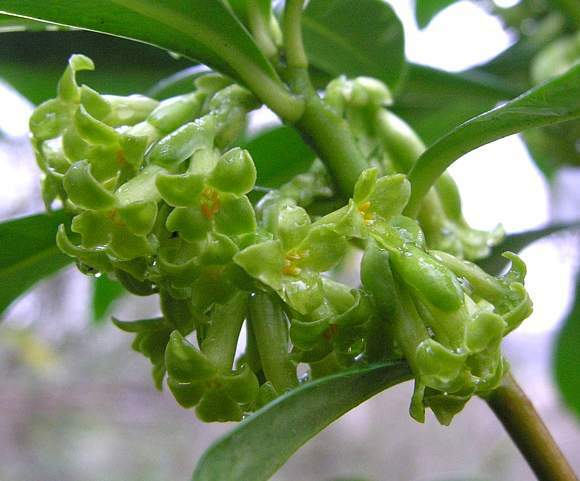 It is in the same genus as Mezereon (Daphne mezereon) but un-like that is evergreen. 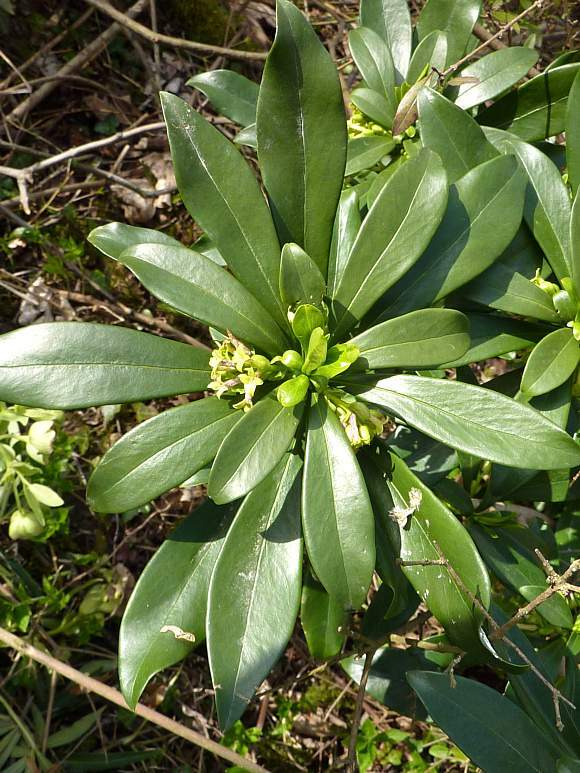 The Common Name Spurge-laurel is a total misnomer, being neither a Spurge nor a Laurel. The berries, which are poisonous to humans but not to birds, are black and appear in early summer. But all parts of the plant are poisonous, probably containing much the same toxins as Mezereon. The sap of the plant is caustic to mammaliam skin causing a rash which may be persistent and it is also dangerous to get in the eyes where it may result in blindness. It contains the Coumarins Daphnetin and its glucoside Daphnin which are both also present in Mezereon. 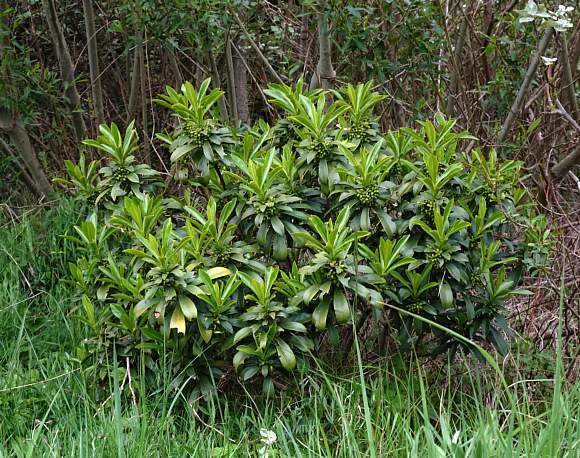 Also some much more toxic phorbol esters, much like Mezereon does as well as many members of the Spurge Family (Euphorbiaceae), which is another possible reason for its common name 'Spurge-laurel'.